How to find shortest distance in 3D? I am trying to find the shortest path by using dijkstra's algorithm and I need to input 3-Dimensional nodes into the program. Each 3-Dimensional nodes have x, y, z coordinates. I am trying to use Nx3 matrix to represent it or maybe Nx4 matrix include the node ID. I found that there is a function which called graphshortestpath in matlab function. 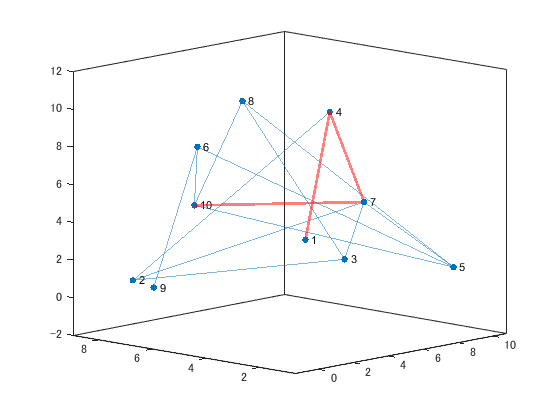 I want to know that is it possible to input 3-Dimensional nodes and plot a graph to demonstrate the result? If yes, please tell me how to do it or give me some examples. If the function cannot do it, please tell me how to do it by other methods. You can use shortestpath function to find the shortest path between selected nodes. I believe the solution would be looks like the following. Thank you very much for your help again. I believe it works even when a graph G contains thousands of nodes. If possible, I would be happy if you could upload your data (e.g Adjacency matrix and xyz coordinates of each node) to try. I also want to know that how to set the link between two nodes? It is because I do not want every single node connect to each other. For example, I have 1000 nodes, node 1 connect to node 2, 3, 4 only. How can I set the connection between the nodes? There are several ways to set hte link between two nodes. One possible way is to use Adjacency matrix, as in my previous sample code. Another way is specifies graph edges by setting start edge s and terminal edge t, and settign weight w for each edge (in this case, s, t and w are N element vector). I have uploaded around 3000 nodes and it is success. However, I cannot generate a graph when I upload 10000 nodes. Is it cannot exceed 10000 nodes? Moreover, I would like to know that what is the difference between function shortestpath and graphshortestpath? Also, If I want to read the source code of the function shortestpath, is there any method? I tried to type "type shortestpath" in the Command Window, and there is some code but I am not sure that is it the source code of the function shortestpath. I believe you should use sparse matrix as an Adjacency matrix when number of nodes is huge. For example, the following code can generate, visualize and calculate shortest path (between node 1~10) of a graph with 10000 nodes. Regarding a second question, the function shortestpath uses an well-known Dijkstra algorithm. If you type "edit shortestpath" in a command window, you can look at code of the function.